Messages in a bottle evoke a feeling of awe and power in many of us because such a simple message has the ability to go a very long way. Chances are it'll end up somewhere you would never imagine, but it's fascinating to know where and the impact it could have. That's the concept behind Ripple, an app that lets you post your thoughts or photos to people nearby and lets each of them choose to share it around their own location. Who knows how far your post might travel? Ripple is a free app for iPhone and requires iOS 7.1 or later. Of course, with the amazing power of the Internet comes lightning speed and viral content not possible by just sending something off in a bottle to float across seas. Using Ripple, you get to be right in the middle of all the action. The default view on Ripple is your Inbox, which is a collection of ripples that have crossed your path from others nearby. The design is a bit like to popular social networking app Yik Yak, but for the most part the similarities end there. Every ripple has three possible actions associated with it. Swipe right to spread it forward to your own radius of people, swipe left to get rid of it, or tap it for more information. While spreading posts might be the point of Ripple, my fascination revolves around tapping each ripple and getting more information. 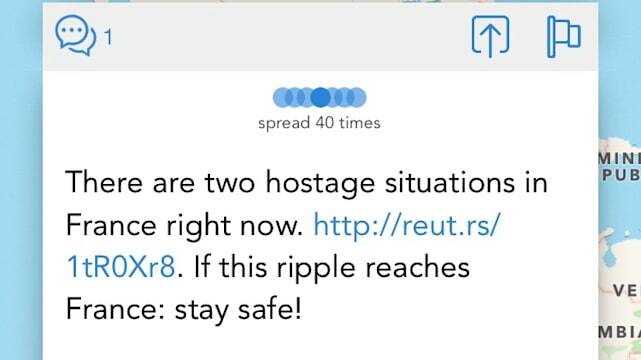 Beyond being able to comment, the post overlays a world map with every location where someone shared that ripple. It's frankly mesmerizing digging through the posts and seeing every unique story attached to them, all starting on one person's phone somewhere in the world. My favorite post rippled 40 times all around the United States and even once in Poland. It talks about the hostage situations in France and wishes for safety there should the post make it there. It hasn't yet, but I shared it with the hope that I contribute to the domino effect. I wish the app included a feature for monitoring where certain ripples end up traveling, but that's already somewhat possible by just switching from Inbox view to the Spread view. This showcases every ripple you passed along. The final view is Started, which is every image or text post you compose yourself. On top of just sharing other ripples, it feels very gratifying to contribute to the stream. If you opt to create an account, Ripple enables a point system for leveling up based on the reach of your posts. If the wonder of seeing a post travel around the world doesn't entice you to start rippling, perhaps this might. While Ripple clearly isn't a mainstream app yet, it didn't entirely seem to be lacking content either. I had plenty of ripples in my inbox. It's not clear what the exact location radius is but it's large enough so that I was never bored. 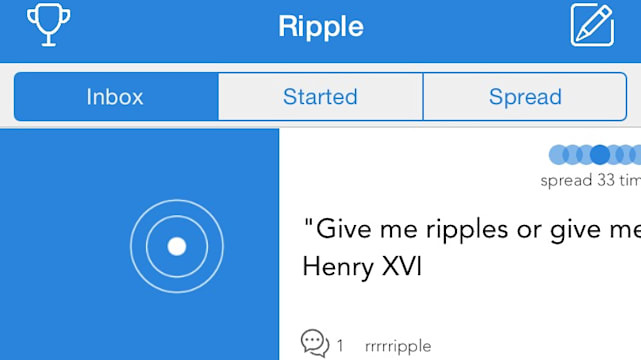 Ripple is a beautiful app that demonstrates the immense power of the Internet. It has all the right ingredients for success: great intention, great design and emotional appeal. Hopefully the app is able to make a ripple of its own. Download for free in the iOS App Store.